The easiest way to create a table seating plan for your event from a small wedding reception to a 4000+ seat gala dinner. Import guest lists. Manage guest details, RSVPs and meal choices. Layout tables. Automatically assign guests to seats based on their preferences. Print plans, charts, place cards and badges. Handle inevitable last minute changes without stress. Save time and reduce mistakes. Try before you buy. Money back guarantee. Thousands of happy customers. Overall: Makes it easy to do our table setups for events. 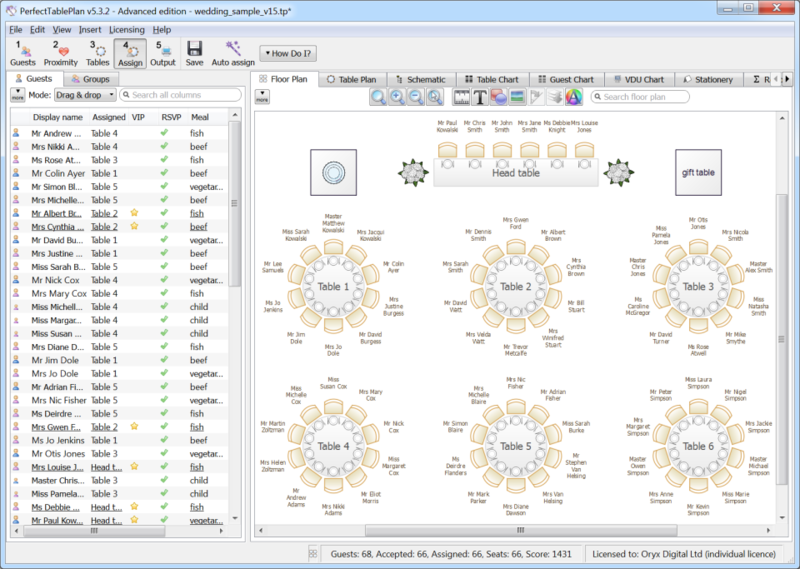 Essential seating plan software for running smooth events. Pros: It's hard to pick just one feature, the system is the whole package. I can maintain a list of who has been invited, record who has accepted or declined, specify who the VIPs are, record what meals they've ordered and print it on their place cards to help the catering staff, record who has paid (using a custom field, which is a handy feature if you want to record your own information), record who should sit by whom - and who absolutely must not sit by whom. This list goes on, that's just some of the features. The options for table layouts cover most of the options you're likely to encounter, with new ones gradually being added if enough people suggest them. Overall: It does exactly what it's supposed to do: generates professional table plans with a minimum of fuss. Neil, Many thanks for taking the time to do a review. I have used Perfect able Planner for a number of years to plan our Association Reunions. Pros: Easy to use, very stable and excellent support when needed. Enter the measurements of the room being used, place the tables, then populate the tables. As easy as that. Cons: Doesn't handle finances very well, it's fine if everyone pays the same, but when different payments are involved, I have to use a spreadsheet. Colin, Thanks for taking the time to review PerfectTablePlan. You can do some basic budgeting using custom fields of type 'currency' in the Advanced and Professional editions. But the emphasis in PerfectTablePlan is on seating arrangements, rather than the financial side of events. Pros: Ease of input, but I would like to see more flexibility in the "Guests Property" dialog box. The graphics in the floor plan is exceptional. Cons: Would like to see a import facility to allow a data base of club members to populate the guest list. It is a shame that new customers get a free upgrade to V6 but the loyal long term users will have to pay. I'll probably stick to version 5. John, Thanks for taking the time to review PerfectTablePlan. You can customize the guest property dialog somewhat using custom fields in the Advanced and Professional editions. You should be able to input your club member database if you can convert it to CSV or Excel .XLS/.XLSX format. If we didn't charge for major upgrade there wouldn't be much financial incentive for us to keep improving the software. If you don't want any of the new features, then you can stay with v5 indefinitely. Please email support if you want clarification of any of the above. Pros: It was easy to create floor plans, place tables, add/remove number of chairs per table. Downloading and sharing with clients was a great option also. Cons: Ohhh my lord, uploading and seating guest lists was TOO difficult. I kid you not when I say I tried to up load an excel spread sheet with guest list and seating assignment took me 7 times to FINALLY get it to work. and we are happy to help if you email support. Pros: Intuitive and easy to use. Lots of reports available and easy to extract information in different ways. Overall: Top notch customer service and unbeatable value. A great piece of software that allows you to manage guests, dietary issues, table names and numbers for any seated event. Many thanks for taking the time to post this review. We are delighted to hear you are finding PerfectTablePlan useful. Pros: Flexibility, presentation, use everything in fact. The level of support provided by the customer representative is unbelievable. Cons: Not knowing enough to really use it properly causes me some embarrassment at times however a quick email to the Support Team gets over this. Jeff, Many thanks for taking the time to review PerfectTablePlan.